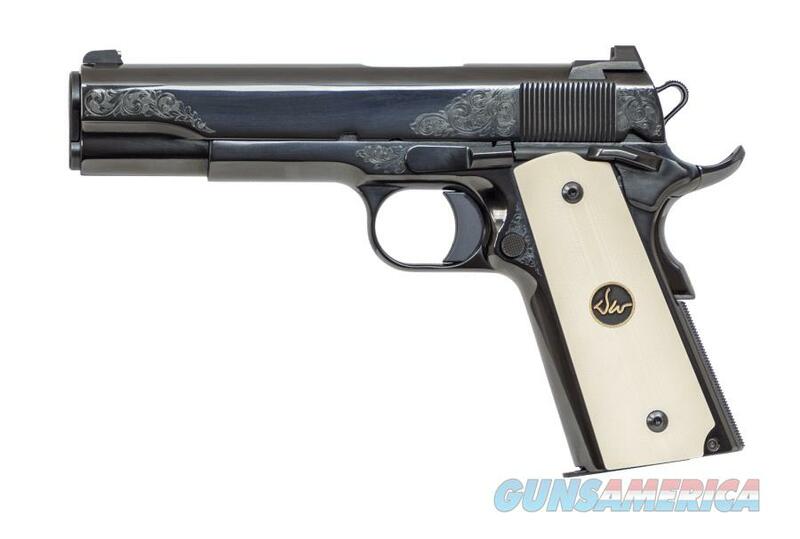 Description: Half a century of manufacturing fine firearms is no small feat, and we are proud to commemorate the occasion with a very special Dan Wesson 1911. Understated class was the theme of the build, with tasteful engraving on slide and frame, slide rollmark delete and a high-polish nitride finish to resemble a quality deep blue. G10 grips have the look of ivory and are inlaid with DW logo medallions while the grip safety and recoil spring plug are engraved and gold-inlaid with “DW” and “50th”, respectively. The round-topped slide is fitted with a brass bead front sight, making this one of the classiest Dan Wessons made to date.